We are successfully catering to the diverse home furnishing textile and home furnishing accessories demands of requirements of our clients. The wide assortment offered is hand crafted in exclusive finish as per the prevailing fashion trends as well as design standards followed globally. We are the Manufacturer, Exporter and Supplier of the wide range of products like Curtains, Drapes, Cushion Cover, Bedspreads, Quilts, Comforter, Duvet & Duvet Cover, Other than this, we also offer Flat Sheet Sets, Bed Sheet, Bed skirt, Bed & Table Runner, Further, we meet the requirements of Hospitality & Leisure which includes Soft Furnishings for Hotel, Restaurant & Banquet. We have been supplying to the leading luxury hotel and leisure brands, independent boutique hotels and high quality healthcare environments with stunning Bespoke Curtains, Bed Runner, Cushions and Soft furnishings, all beautifully made in variety of fabrics. All made to measure drapery with a full site survey and installation service available. Our range meets the requirements of our clients in terms of varied styles, designs, patterns and color combinations as well as in finish requirements. As a well known name in the industry, we ensure that we judiciously use our resources towards meeting with the client's expectation within desired frame of time. Our credibility in the industry is vouched on quality of the products, which we offer. Leveraging on the experience of our skilled craftsmen, state-of-the-art manufacturing and finishing machinery and designing equipment, we have been able to attain a significant position in the International Arena. 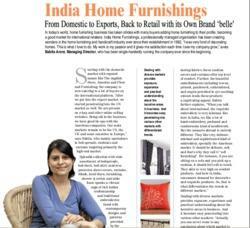 Manufacturing, Trading, Importer and Exporter of Home Furnishings. In july'2013 our company have been acknowledged by "Apparal Online Magazine"
For information the magazine pdf is attached in which an article was published for recognizing the work done by Ms. Babita Arora. We have a capacious storing unit, which stores our products categorically under proper labeling. This ensures in easy management of the inventors and results in smooth delivery and dispatch at the final destination. Besides a proper warehousing system, we also lay complete emphasis on the packaging of the products, which are done using qualitative packaging material to ensure the safety of the products during the transit till the time they reach at the final destination. We also offer special packing incorporating the buyer's brand name, logo, label and other specific packaging. We have adopted sampling policy to eliminate the risk of consignment rejection form the client's end. Under this policy, we develop sample proofs of products and send them to client's end for final approval. The necessary changes are incorporated at the initial stage and once the product samples are approved by the clients we move on with the final production. This approach ensures minimization of rejection, wastage of resources and creativity. We are equipped with state-of-the-art production facilities, which enables us in the production of flawless products as per customer's specifications. Our production unit is well segregated into various departments for designing, printing, embroidery, sewing, sampling and packaging under one roof to facilitate the process of production. Our splendid array of vibrant as well as exquisite home furnishing textiles and home furnishing accessories are aesthetically designed & manufactured to cater to the choice and preferences of clients based world over and feature rich collection of Indian culture and modern lifestyles. We also design products keeping in mind preferences of our clients spread both in the national as well as international markets. Our entire array is available in the most fascinating varieties of fabric and other material choices, which help us to deliver in them exclusive finish standards. We nurture a team of skilled craftsmen, which is very talented and is well adaptive to the changing trends of the industry. It ensures in the production of the most fascinating varieties of home furnishings and handicrafts. Our team forms the backbone of our organization as it leaves no stone unturned towards impeccable designing and creativity that is reflected in our range of products. The exuberant wonders of our team in our stylish range of handcrafted products and home furnishings are quite in vogue.